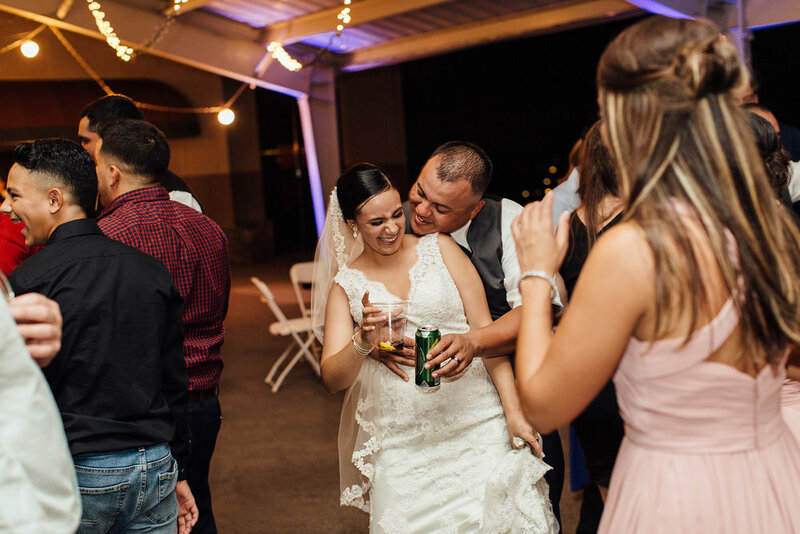 One late night out dancing, Benny and Melanie were introduced to each other by mutual friends. As they were dancing together, for the first time, Benny playfully told Melanie he was going to marry her. Fast forward from many years of friendship, flirting and lots of nights spent dancing and here we are! On a Saturday in late summer, Benny lived up to that promise of many years ago and married that girl he met dancing. 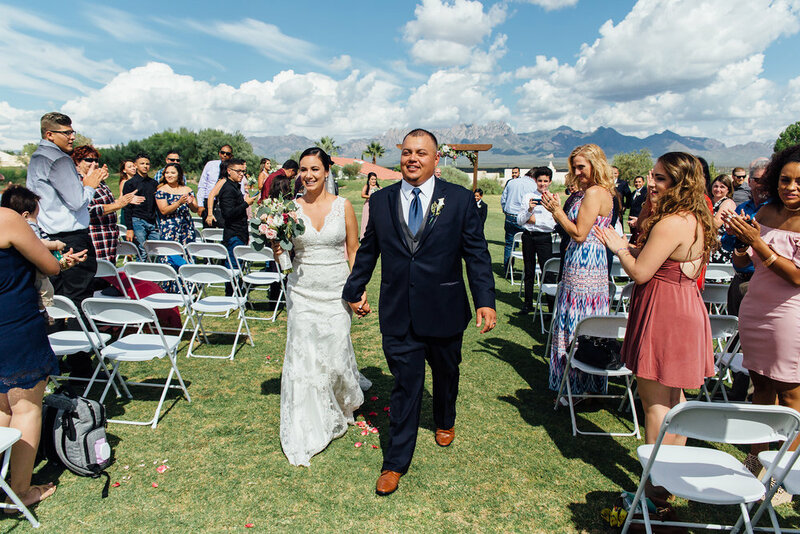 Melanie and Benny planned their wedding ceremony to take place on the driving range of the Sonoma Ranch Golf Course insuring a beautiful view of the majestic Organ mountains. 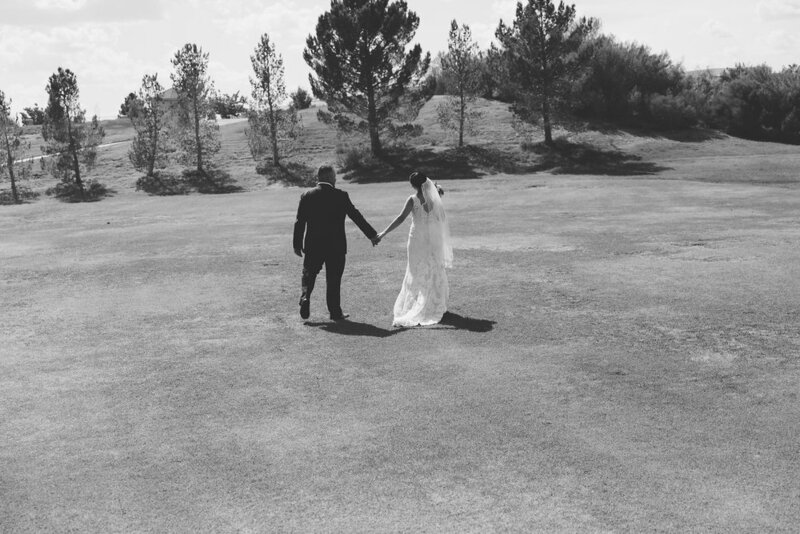 Their wedding day was warm and sunny with the occasional cloud teasing the guests with a small patch of soothing shade. I know a lot of people get excited about fall and autumn, but I am completely fine with the idea of a year long summer. Summer stay forever. You can't beat that just married smile. Capturing the overjoyed and ecstatic faces of brides and grooms as they exit the ceremony may be one of my favorite moments of the wedding day (shhh, don't worry, I still love you bride and groom styled portraits!). As Benny and Melanie walked away, I stepped behind them and let them pass me which allowed me to document this sweet, quiet, just the two of them, moment. The bridesmaids wore long flowing gowns from Azazie in a muted, dusty rose shade. The groomsmen wore navy suits. I love how navy seems to instantly elevate any color palette without drowning in formality. 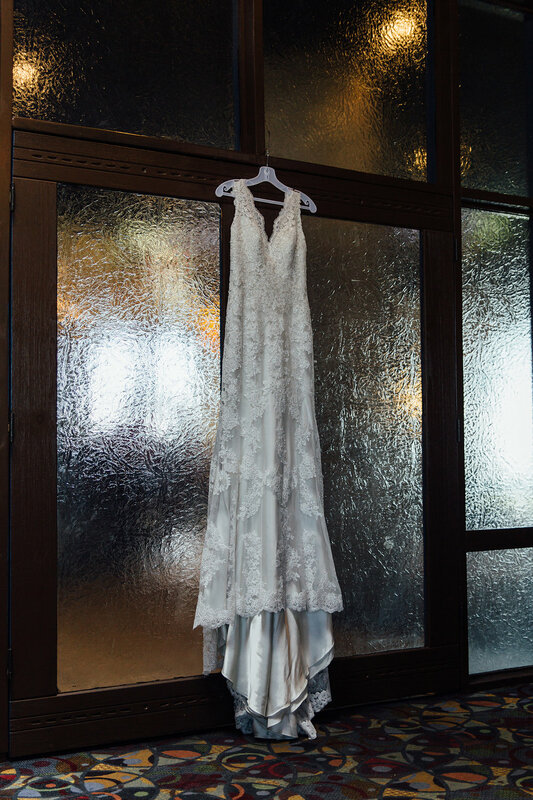 Melanie and Benny's wedding style could be described as easy summertime glamour. I love this photograph Nate created from an unexpected angle as I was busy photographing the bridesmaids as a group. 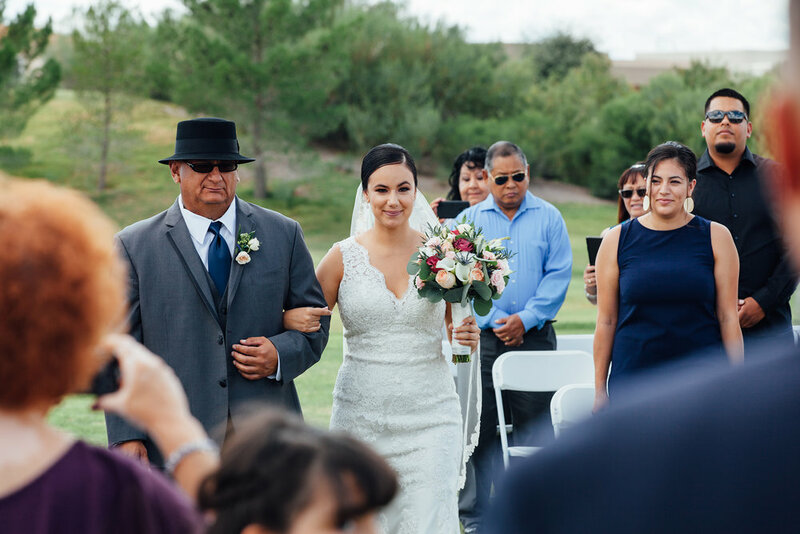 Melanie's bouquet was designed by the talented team at Barb's Flowerland and featured white calla lilies, soft pink roses, bold merlot roses with blue thistles. The blue thistles add just the right amount of drama to this bouquet to keep things interesting. Melanie's sleek and sophisticated updo was done by tHAIRapy Salon. Doesn't she look stunning?! Such a classic beauty. 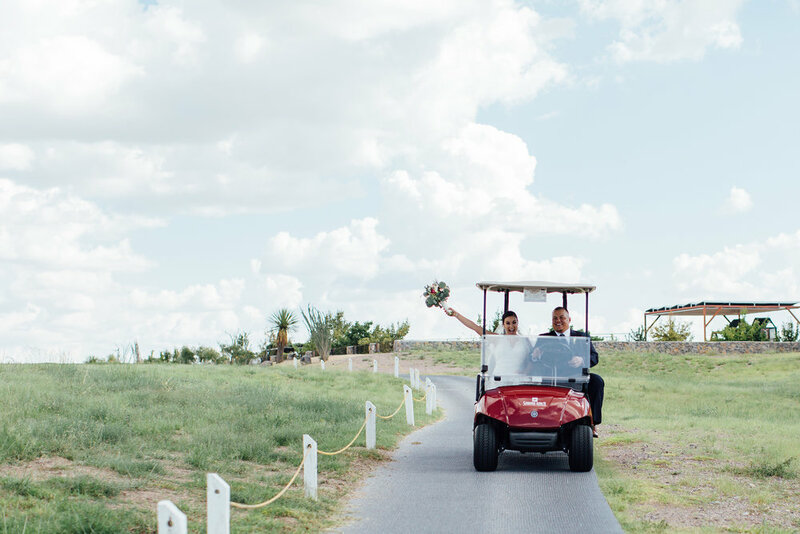 Obviously I big perk of getting married on a golf course is the sweet ride you'll drive around all day. 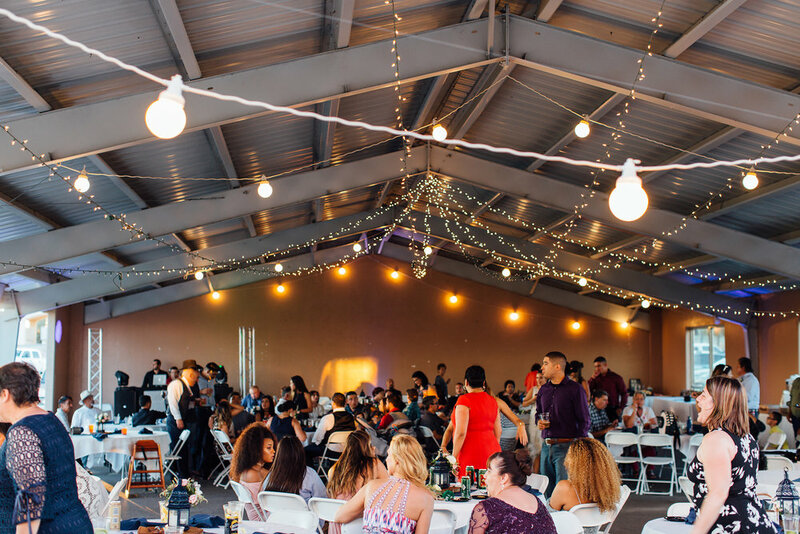 After we jetted around the Sonoma Ranch golf course for bride and groom portraits, dinner was served al fresco in the covered pavilion patio of the clubhouse. Simon and the whole team at Sunset Grill did a wonderful job serving and catering a yummy meal. A family friend made a classic white fondant wedding cake and garnished the tiers with more soft pink roses. Benny told me the only bite he got of the whole cake was the bite Melanie fed him as they cut their wedding cake. He was too busy dancing with his beautiful bride. Thank you New Mexico sunsets! At their wedding rehearsal, the day before I asked Benny and Melanie how they were feeling. They told me they were just ready to be married and enjoy their day with family and friends. I am so glad that is exactly how the day unfolded. They danced and danced and I cannot think of a more poetic way to celebrate how their love story began.